Cashouts: 24 hours up to 15 business days. Intertops is the definition of class and trustworthiness in the sportsbook industry. The company has continually been on the top of most “Best Of” lists in the online gambling world and their reputation as a sportsbook is head and shoulders above the rest. 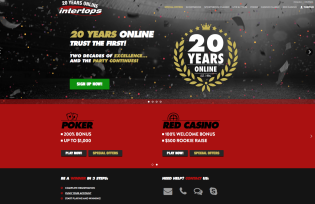 Besides other long-standing bookies like Bovada, Pinnacle and 5Dimes, there really aren’t many others with a customer base as large as the one here at Intertops. Intertops was originally a brick and mortar establishment that accepted sports wagers as far back as 1983. Once the advent of the internet came around in the late 90’s, that’s when the company opened its virtual doors so to speak. They have been online since 1996 and have their headquarters based in Antigua and have licenses there, Barbuda and the Mohawk Kahnawake Territory out in Canada. 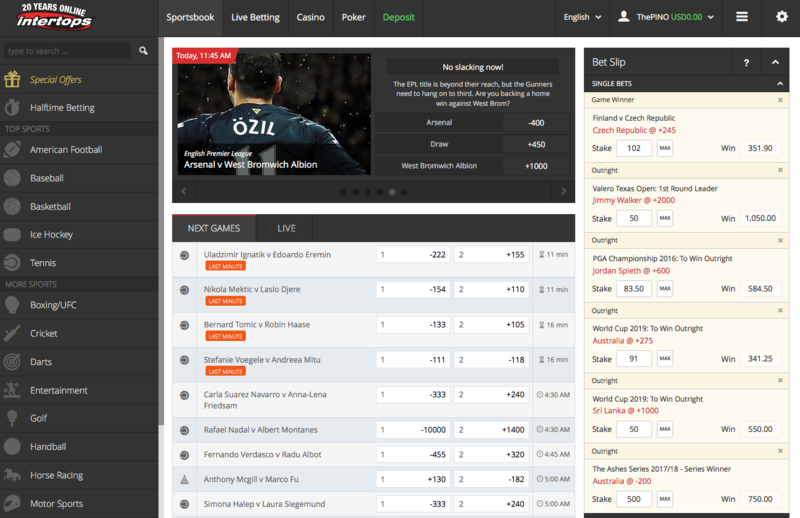 Their sportsbook stands out to me immensely because it’s very user-friendly and extremely responsive. Their lines are very generous and they offer a ton of variety in terms of sports markets, live betting options and additional gambling alternatives (ie casino and poker site) for its customers. Check out our official review for more information on Intertops and let us show you why this is one of the premier books for not just US players, but players all over the globe. >> Sign up today for access to up to $200 in FREE bonus cash now. One of the highest-rated and most trusted sportsbooks in the industry. Easy-to-clear bonuses with decent rollover requirements. Tons of sports markets & lines. 1st time deposit bonus is lackluster and are well below industry-standard. Dropoff in parlay and teaser values over the years. Max bets are capped in the low 4-figure range on major sports. The deposit bonuses that Intertops offers new players is short, simple and to the point. Depending on what you choose, you have a chance to earn up to $200 in added bonus money. These bonuses will be immediately released to your account once you have wagered the FULL amount of your deposit. After you’ve done this, just contact Live Chat on the intertops.eu website and tell them which bonus code you want applied to have you cash credited to your account. 200% up to $50 (BONUS CODE “ROOKIE200”) – This bonus is enticing for the beginner bettor. It allows a customer to deposit a lower amount but see a bigger bonus in the end. The caveat to this is that this bonus has a higher rollover requirement compared to the rest – 8X. 100% up to $100 (BONUS CODE “ROOKIE100”) – This bonus is solid because you get a 100% match and the rollover requirements are lower than the previous one mentioned. The rollover is only 6X if you select this bonus. 50% up to $200 (BONUS CODE “ROOKIE50”) – This is the easiest of the deposit bonuses to clear at Intertops, at just 4X the rollover requirement. Between this bonus and the $100 max choice, you can’t go wrong! >> Sign up at Intertops now to take advantage of these bonuses. $20 Signup Token – Earn this once you make your first deposit and wager $20 or more. Once this happens, contact support and you will get your credited a $20 FREE BET to the account. “Good Luck Giveaway” – Players will get a 10% bonus up to $50 when a deposit is made every Thursday using a method that is NOT a credit card. $1,000 Parlay Prince – This monthly promotion is pretty self-explanatory. Whatever player cashes in on the biggest parlay bet of the month, that person will get credited an extra $1,000 bonus into their account. Intertops offers some of the top sports markets and lines anywhere in the biz today. That should be no surprise of course, as they are regularly ranked as one of the top sports betting options in the USA and around the world every year. 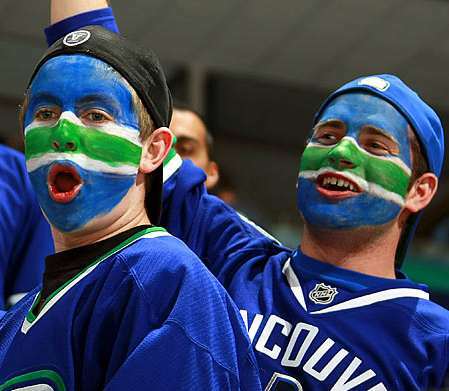 Along with all the major sports leagues – NFL, NBA, NHL and MLB – they also offer betting lines for smaller, more obscure sports like tennis, cricket, darts and even politics. Most sites shy away from offering wagers on entertainment and the stock market, but not Intertops – they are regularly setting the bar high when it comes to the variety of betting options that are made available to you. 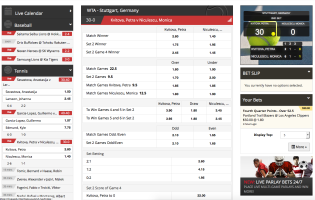 The sports lines page at Intertops features one of the most intuitive platforms in the game. 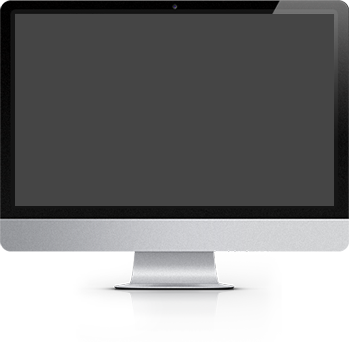 It is 100% responsive and also available for view from your smartphone and tablet. Aside from the “Big 4” sports leagues, you will be able to bet on the following: tennis, boxing, UFC, auto racing, golf, handball, snooker, darts, soccer, horse racing, volleyball, politics, non-entertainment and entertainment events, the stock market and politics. We will also break down the more popular sports being offered to USA players and international punters. The most popular sports that are offered to American players is hands down anything to do with football. NFL and NCAA football take in huge amounts of action during the season and it’s no surprise they headline this topic. Other popular sports are NBA, MLB, tennis, golf and even soccer. Intertops offers solid lines for all these sports, including props and futures options that pay out handsomely compared to its competitors. Soccer makes up a fair amount of action at sites like Intertops and live betting shops throughout Europe. The sport itself has dozens of individual leagues across Europe, Asia and South America, which amount to THOUSANDS of games being bet on alone through out the year. This is why Intertops normally has free bet promotions on soccer games almost every month and is another good reason you should be signing up for an account if you haven’t already. Other popular markets include NFL and NCAA Football action, as well as other obscure sports like tennis, golf, cricket, boxing/UFC and darts. Every 4 years, you will notice a huge uptick in betting on the United States Presidential Election, which is one of the most widely bet NON-sporting events in this industry. 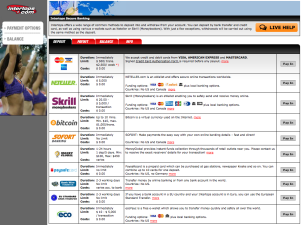 The layout of the Intertops website makes it simple to select a sport, pick a bet and confirm it within seconds. From the left side menu, you will have the option to pick what ever sport you desire and you will instantly get game information, spread, totals and moneyline options placed directly in front of you. It doesn’t get any easier than that. If there is a down side to some of the bets offered, it’s that they no longer seem to offer competitive pricing on parlays, teasers and props. In fact, I’ve noticed a small drop-off in props options over the years. As far as most of the other bets, they offer really competitive pricing compared to other sportsbooks, especially on standard spreads and moneylines. Like most sportsbooks these days, Intertops has seemed to move away from their once solid stance on high-limit bets, especially for major sporting leagues. They don’t really give you a clear-cut answer on betting caps when you talk to support, but you can easily see what the max bet is by selecting the game of your choice and hitting the “MAX” button on the betting slip on the confirmation screen. If you check out NBA, MLB and NHL games, these bet max’s are normally anywhere from $200 to $600+ on individual games, regardless of bet type. For NFL games, this max can vary from $500 to $2,000 per game, with this sometimes being even higher depending on the time of the year during the season (ie playoffs and Super Bowl). These are pretty low compared to other books that sometimes offer maximum bets from $3,000 to $25,000 per game. For other sports, like international soccer, you will see the limits sum up DRAMATICALLY. At the time of writing this review, I saw bet caps hit $32,000 on single Premier League games. Unfortunately, for other international sports like cricket or darts you will see these limits hit a standstill at $50 to $100 betting maximum’s. The disparity with these numbers is beyond unusual. There are a plethora of banking options available to players at Intertops, including a solid amount for USA players, which can sometimes be difficult to come by at some books. In total, there are a DOZEN different methods you can take advantage of when it comes to funding your account. ** Options in BOLD are USA-friendly deposit methods. Check ($150 to $3,000): Takes up to 5 business days to receive. CardPay ($100 to $5,000): Takes 3 to 15 business days to process. Bank Wire ($150 to $2,500): Takes 3 to 15 business days to proccess. 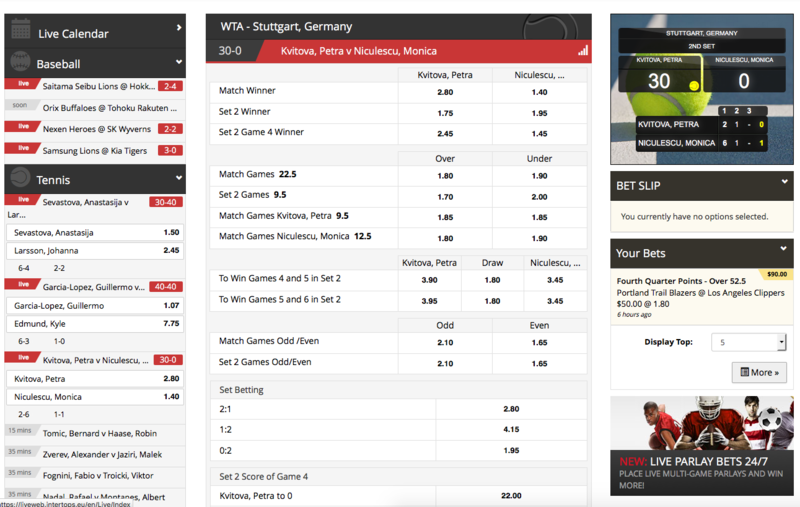 Neteller (up to $2,500): Takes 48 hours to receive. Skrill: Takes 48 hours to receive. Bitcoin ($100 to $2,500/week): Receive within 24 hours. 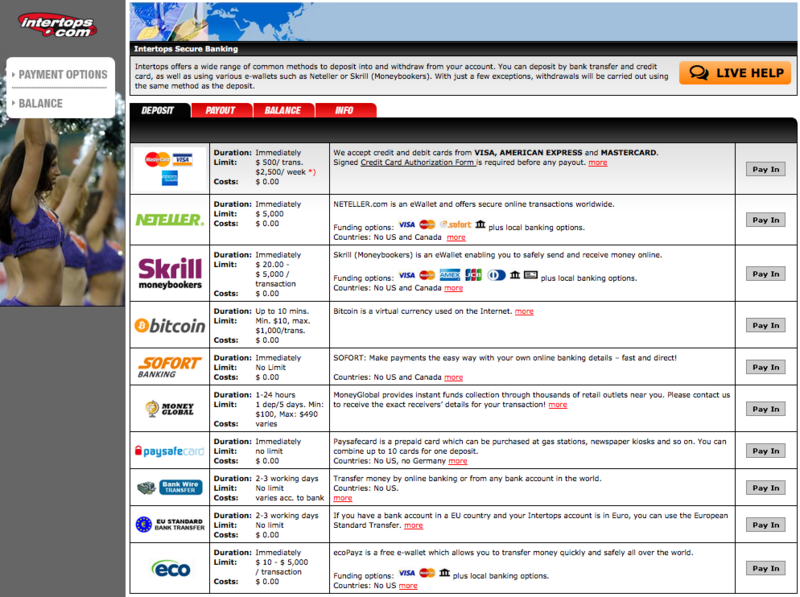 EcoPayz: Processes within 48 hours. SEPA : Takes anywhere from 2 to 4 business days for processing. ** Options in BOLD are USA-friendly withdrawal methods. Intertops, which already boasts the most dynamic betting software on the web, also has a high-level mobile platform for its users as well. From a personal standpoint, it’s probably one of the best mobile sites I’ve ever placed a bet on. This mobile software has been upgraded dramatically to reflect the top-tier quality of the sportsbook itself. You can view intertops.eu from any smartphone or tablet that has an integrated browser. Basically, you will be able to see your account dashboard, in-progress bets and check out a ton of lines and markets straight from your iOS or Android-powered device. For those of you who still have a BlackBerry will also have access to Intertops’ renowned mobile platform. Betting on your phone has never been simple that it is now. The only thing I wish Intertops offered was some type of free mobile bet, similar to what BetOnline and SportsBetting.ag give to their players. However, you’ll just have to settle for their standard bonus offerings for the time being.